and is often defined as a moving dot. 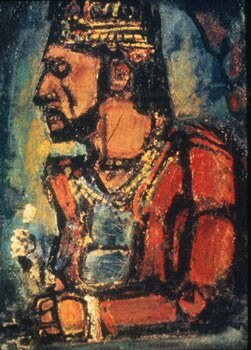 in a drawing or painting. This poster shows how just a few strokes of line can be used to effectively illustrate a swan. While the lines do not adhere to the anatomy of a swan, the image is unmistakable, and the simplicity and grace of the lines convey a feeling of tranquility. There are no excess lines; the poster has just the number of lines needed to communicate this image. Particularly successful is the use of wavy lines to communicate a reflection on the water. 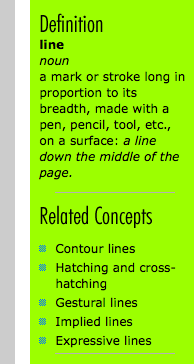 Type is used sparingly (only along the left edge,) and only to provide needed information to the viewer. 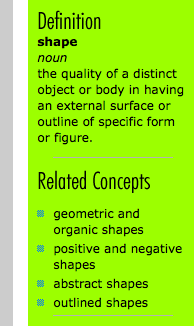 can be geometric or free-form (organic). arrangement of shapes in a work of art. 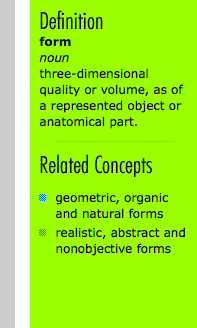 three-dimensional aspects of objects that take up space. • Forms can and should be viewed from many angles. indentations, extensions, and edges - their forms. 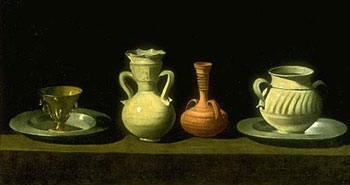 (two of the vessels and the saucers they sit on, and the table under all of them.) Shading creates three-dimensional forms out of shapes. • Value refers to dark and light. • This type can be read because of the contrast of dark letters and light background. 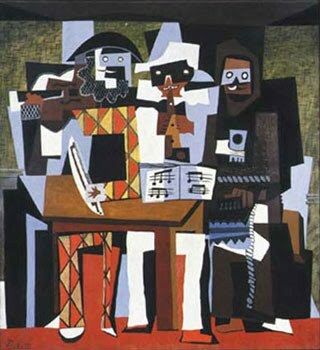 • Value contrast is also evident in colors, which enables us to read shapes in a painting. seen in a black and white version of it on the right. 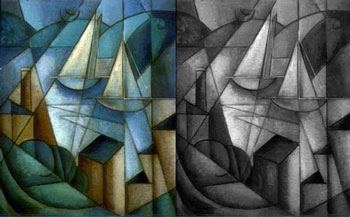 The painting is cubist in style with angular fractures and shapes. Follow the visual movement from the bottom right over a light-valued visual path upward to the top left sail, which is the focal area. A high contrast in value can help define a focal point. • Color depends on light because it is made of light. • There must be light for us to see color. • A red shirt will not look red in the dark, where there is no light. • The whiter the light, the more true the colors will be. • A yellow light on a full-color painting will change the appearance of all the colors. 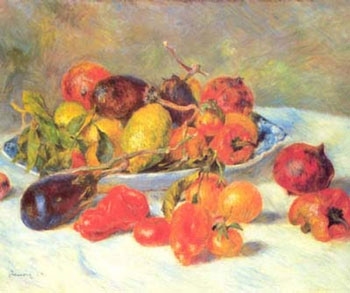 Renoir painted this painting to emphasize the color and richness of the vegetables and fruits of France. 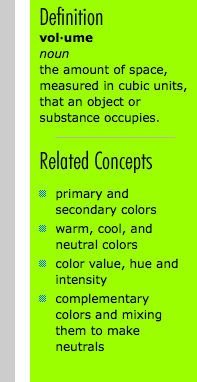 It is basically a cool color with warm accents. Renoir was an Impressionist painter who used color to show depth and volume in his paintings. tones consist of any color on the warm side of the spectrum: yellows, reds, oranges and purples. 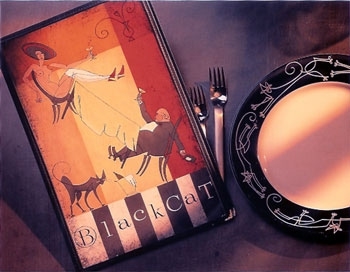 The effect is great for a menu because it communicates a comfortable feeling and a compatibility with food. Could you imagine this same menu done in cool tones: blues and greens? The effect would be completely different. It is no coincidence that most fast-food restaurants use yellows and reds for their identities. These colors have been shown to be among the most appetizing. • Texture refers to the surface quality, both simulated and actual, of artwork. • Techniques used in painting serve to show texture.